Today was another great day. Opportunities to learn keep coming my way. Most days, the learning is from my own mistake, or from a friend, a book, an article shared via twitter, a reflection, and from everyday life. Today was a chance to learn with colleagues from a very entertaining facilitator, Jim Sorensen of www.fierceinc.com . 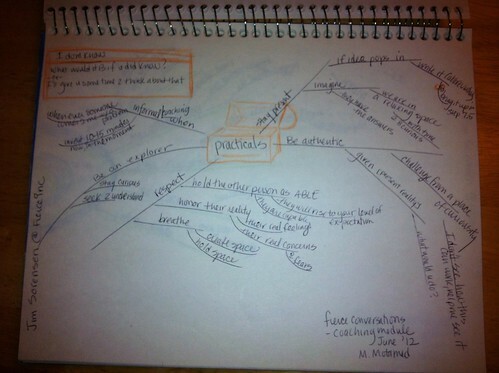 We practiced the Coaching Module from the book, Fierce Conversations. Thank you www.efi.com for the learning initiative! My sketchnotes are here from the class! And a key takeaway was the informal coaching practice. Which is another way of being a Collaborative Leader. Everyday people walk up to me and share an issue, and idea, and problem, a complaint. I try to listen and not jump into problem solving. Fierce calls this way of being “informal coaching.” I like the term and the practice was great, too. I was also inspired to see all my colleagues learning this framework, too. Now I have a bunch of peers ready to practice this stuff with. I am #happy. And certain that this will be a difference maker for us. You can be an everyday coach, informally, throughout the day. Collaboration is a word that we generally associate with teams, not with leaders. Teams collaborate, and leaders lead, right? If a leader wanted to be collaborative with an individual, what would that look like? With a large department or group? With other executives? This may sound attractive in theory, but it can be difficult to recall examples of what this would look like. So, you want to be a more collaborative leader? Here are 10 practical, real world examples of how this could look for a manager today inside a corporation…. 1) When it’s annual budget planning time, invite team members to suggest what will be needed next year, when and why. Include “nice to haves” too along with rationale. This can take the form of a shared spreadsheet on Sharepoint or GoogleDocs. 2) When it’s time to assign work or tasks, try asking for volunteers instead. For extra credit, try assigning responsibility instead of tasks. Delegate. It’s empowering! 3) When you do need to assign something to a specific person, still ask… “Would you please “… and leave space for the person to decline, if they feel strongly. Give as many choices as possible. Choice is collaborative and it is also empowering. 4) Create space for things to go right. Find a way to have vision that the team can succeed. If you have doubts, the team or team member will sense your doubts. Share the concern and then ask how they feel and ask what is needed to mitigate. If the concern is with an individual team member, communicate one-on-one. In either case, be hard on the issue, and soft on the person. 5) As a collaborative leader, it’s important to say what you think. But, if your emotions (including anger) are still fresh and unchecked, the timing may not yet be the best. Try reflecting on your intention first. What do I hope will happen as a result of this sharing? What is my intention? Speak the truth in love. 6) Make a “travel” bag of collaborative tools – sticky notes in several sizes and colors, blue painters tape, index cards (in while and maybe an extra color or two). Let team members know that they are welcome to take this bag to gathers too…it’s a shared resource. Keep it stocked and ready to go. 7) Share information openly whenever possible. Share it in a way that allows people to quickly know if this is optional to read versus if it is integral to their day-to-day mission. For example, if several times a week you have “FYI” info, consider posting to an internal blog, board, or even an email with a easy to categorize title. For example – Just FYI #1, Just FYI #2, or Learning about our customers #1. Learning about our customers #2, etc. 8) To develop annual performance goals for and with a larger group, start a collaborative space on a team wall with print-outs of the related missions, goals, and visions that we want to align with. Then, start writing sticky notes with brainstorm ideas of potential goals. Invite team members to contribute with this silent brainstorming method. Write new sticky notes with updated summaries of what looks best for the team. Encourage participation. Leave the wall up for a while so that people can see the connection between suggested goals and what was decided. 9) When a few people are remote and the rest are “all in one” room, leave a webex with chat window open and projected onto an easily visible screen so that the remote folks can chime in with written ideas and questions and even a “raised hand” via chat during the conversation. Because it is very hard to collaboratively join in when you are a single remote person to a team. Of course you can use a webcam based system to give the remote person visual cues. But the running chat window along with webconferencing or other tools like googledocs or Confluence is a practical alternative. 10) Another collaborative idea for including remote team members is to post snapshots of the team idea walls and boards every week and post to a shared location. Our admin (who we love) takes the pix and posts to Sharepoint every Monday. Would be great to add occasional photo’s of the team, too. and ask remote team members to share pix from their life as well. Even pix of their backyard or the recent snow story can help to bring us closer. I am inspired to write this series because I am learning that being “agile” is not enough. Starting up 15+ scrum teams is not enough. Hearing that team members that are happier in self-organizing teams is not enough. Even delivering frequent, iterative value is not enough. Without Collaborative Leadership, we will revert back to the old way. Slowly. Surely. Sadly. I am a manager inside a large enterprise. There are the ways that I am learning and practicing Collaborative Leadership… try it, you’ll like it! 1) Hiring is a critical time. People make the difference. 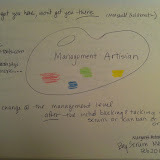 How will you collaboratively find an A player who will fit with your collaborative environment & who can do the work? Be collaborative Send a draft job description to the team members who will work with the new person. Invite their edits and comments! Invite their referrals for the position – after all, who better to recommend a great candidate? Invite these same team members to collaboratively build a set of interview questions and invite them to contribute to the interview timings and structure as well. And after a round of interviews is completed, invite the interviewers to a collaborative sharing and discussion of the candidates. This collaborative candidate review is powerful and revealing. Before we start the interviews, I would like to request your ideas and input on the interview process .. In some cases, team members enjoy interviewing their potential manager in pairs. People have shared that they found this helpful because they were also able to observe the candidate answering other person’s questions. And they learned from one another how to improve their own interviews for the future – by that observation. Is this something that you are interested in trying? We will hold a group debrief following the interview so that everyone can share their impressions with one another. I am finding that this is very valuable because it allows us to hear different perspectives upfront, before hiring. And also to build together a stronger picture of what we need in the new member and why it matters to us. For example, in the past debriefs, several people commented that they felt that a given candidate would “go to bat for them.” This was significant because two different people commented this about two different candidates. Now we know that our candidate will need to be strong in this quality. I would also love to hear your ideas on who we want to be on our interview panel. Who is effective at interviewing? 2) Be vulnerable. Share your own learnings. Your own mistakes. We don’t learn by always being perfect. In fact, none of us is perfect! 3) When it comes time to Celebrate – plan the celebration together. Enjoy celebrating as a group and ask team members for celebration suggestions. 4) Everyone loves to be appreciated. And yet appreciations are infrequently shared. Try making an Appreciations wall with sticky notes and public appreciations. Go first, add the first appreciation note, sign and date it so that older appreciations can be aged out. Appreciate teams too! So much of what goes right is due to successful team collaboration. 5) Keep gardening – this is how we soften the ground, it’s a marathon without a single destination, not a sprint a. Use internal blogs & newsletters to encourage and nurture new ideas and soft ideas. I recently wrote an internal blog post called “I’m bored”…I can already see that this will be a “best seller” post because it is hitting a nerve. People care. People read. People talk. Give them something deep to talk about, insightful, meaningful, challenging. Plant seeds. 7) Sometimes, you will still need to “take charge.” Being a collaborative leader doesn’t make you a fulltime facilitator, a wallflower, or worse yet, road-kill. Some decisions need to be made independent of the team. The world is not a black and white place. There is a lot of gray, and fuchsia, and aqua, and many other colors! Ask yourself, “with more time, would I be able to make this decision more collaboratively?” and if the answer is no – then stop pretending that the decision is still open for collaboration. Instead, get open with the team and explain both the decision and your rationale. 8) Relationships & alliances matter– you are not the lone ranger or even the lone facilitator– this is a system we are talking about. And relationships matter more than hierarchy. More than titles. 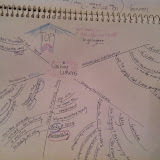 More that org charts. To get more of a sense of how alliances form an energy pattern, reference Michael Spayd’s work with Constellations here and here. Whenever you sense tension in a relationship, then in fact there is tension. And it’s good to keep that in mind if you are expecting the other person or group to collaborate with you, your team, or your initiative. The February BayScrum meetupwas a circle discussion – as Ted had suggested last year -we shared our learnings and challenges around agile coaching and transformation. I was fortunate to be an assistant in the November Coaching Stance class… with Lyssa Adkins, Michael Spayd, and Cynthia Loy Darst, what a great learning experience. I highly recommend this class – this learning and practicing experience! My big takeaway – Wow it is much harder to be an assistant rather than a student. Being a student I get to focus much more on me. On my learning. On what I am taking in. On what I am practicing. And when I am a student all of the other students are my peers, my fellow learners. We are connected with relationships. We see one another, we meet, we interact, we connect. Being an assistant is all about helping the students and the “front of the room leaders” to be successful. It is a chance to practice a continuous level 3 focus. A soft focus – tuned into everyone else’s learning. Tuned in to the system of people in the room, the whole environment, the place. Lyssa explained that it is about both holding space energetically and also holding the space for B.O.D. Beauty, Order, and Design. I notice that this is often my role. When I am leading a meeting at work, I am responsible for both facilitating the meeting and for holding the space … how much nicer it would be to have an assistant – someone helping to “hold the space”… I will ask for that help now that I see the value and importance! On the second day, I was a participant for part of the day – which I loved, now double valuing the chance to both build relationships and learn new ideas about coaching. One of my favorites was a game where you take turns coaching someone else – with a twist that the coach is given frequent prompts to try specific practices – like comment on Level 3. It made me very much more aware of where my questions and comments are coming from at any given moment. We laughed a lot! I also loved the chance to meet and interact and learn from a great community of coaches. We are coaches now. Because we WANT to coach and help others. It doesn’t mean that I am a great coach, or the best coach. Still –all of us in the class, we are all coaches now! 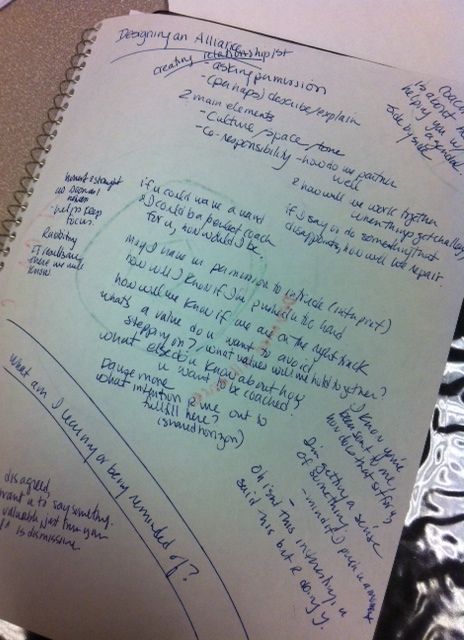 As usual, I have posted my notes … here are the images. One of the tools that I learned about in The Coaching Stance class is how to design an alliance (based on CTI work) . At first I was think – no way – I am not asking any of my friends and co-workers to sign a “coaching contract”…and then as I listened and we practiced I began to learn that it is not about a piece of paper. It’s not even about a contract. It’s about the relationship. This helped me to understand why in so many classes – at the start of the class the instructor often starts with ground rules…asking the participants to contribute ground rules. I am always thinking, let’s go! Just tell us the ground rules, no problem. We are wasting time 🙂 But now I see that the teacher is designing a kind of alliance too. By inviting us participants to contribute. It is even effective – because when someone adds to the list “full participation” or “everyone participates” I am reminded to both step up my game and also to invite others to speak up through out the session (because I am a Myers Briggs extrovert… often talking – thinking outloud… like right now even as I write this post. And so many of my fellow learners are introverts…. This post is not about cubicles or office layout! Rather it is about creating space for people to be authentic and collaborative … all at the same time! I learned more about this in a recent The Coaching Stance class … with Lyssa Adkins, Michael Spayd, Cynthia Darst, and David Chilcott. The first day Cynthia and Lyssa were our “front of the room teachers” while Michael and David “held the space” and the second day Cynthia and Michael were our “front of the room teachers” while Lyssa and David “held the space.” And the class unfolded I bcan to get a much better sense of what it could mean to “create and hold space” for people. At work and at home. Just by watching and experiencing the environment created. So happy to be able to practice this with some great role models nearby!